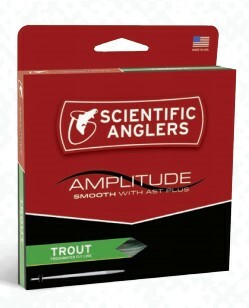 Scientific Angler's brand new Amplitude Smooth Series of fly lines combine the slickness and durability of their proprietary AST Plus slickness additive with a classic smooth fly line coating, eliminating the "humming" found in the standard Amplitude and Wavelength fly lines. These lines are smooth like traditional fly lines, but have increased durability and "shootability" due to the addition of the AST Plus. 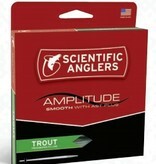 The Trout Amplitude Smooth fly line comes in a single color styles with three differentiating color-ways (Celestial Blue/Bamboo/Blue Heron) to help quickly identify the separate parts of the line, and welded loops for quick and easy rigging.